Sheep And Berries – What More Could You Ask? Is this not the perfect jam for a fiber junky? Eweberry Farms raises sheep and berries. Yarn and jam. Yum! And it’s right here in Oregon. 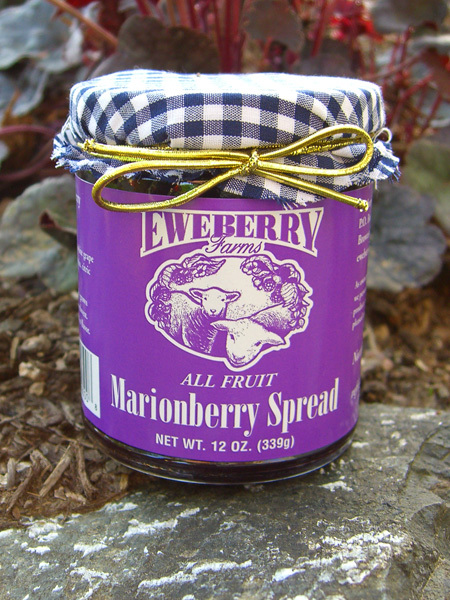 Am I the only one who has always wanted to send a jar of marionberry jam to the former mayor of Washington DC? In knitting news, I read the Embossed leaves pattern wrong and ended up frogging out the toes. Oh well. I almost have them knit again. I’ll try for pics tomorrow. I decided to try to knit the leaves the way the pattern shows because the ridges on the toes finish the ends of the last leaves. I’m not sure if this lace will knit backwards or not. Some will, and some won’t. If not, then I’ll probably frog the toes (again) and re-knit without the ridges. #1 Son breezed home in the wee hours of the morning. The path of the tour just happened to come through Portland. I think he leaves again tomorrow. It’s great to have him here, even if only for a little bit.